PRODUCT DESCRIPTION: Heavy gauge steel, about 20 gauge, which is 15 inches long with a 4 inch diameter. The trap features a crushing type mechanism located in the middle of the pipe. When set, the pipe appears to be hollow. The trip pan is located in the middle of the tube and when the target animal moves over it, the jaws of the trap move up and crush the animal to the side of the pipe. It works quickly and effectively. An added advantage is that the animal remains inside the pipe barely noticeable after it is killed. Also, the Pipe Trap is easy to hide in the landscape. Just use some pine straw or other natural part of the landscape and as long as you keep both holes visible and above the ground, target animals will find it. TARGET ANIMALS: Squirrels, ground squirrels, prairie dogs, gophers, chipmunks, rabbits and more. WHERE TO USE IT: Alongside trees, around ground cover or along trails you know target animals are using. Such trails may be on a roof tops, in an attics or in a hole through a fence you know they use. 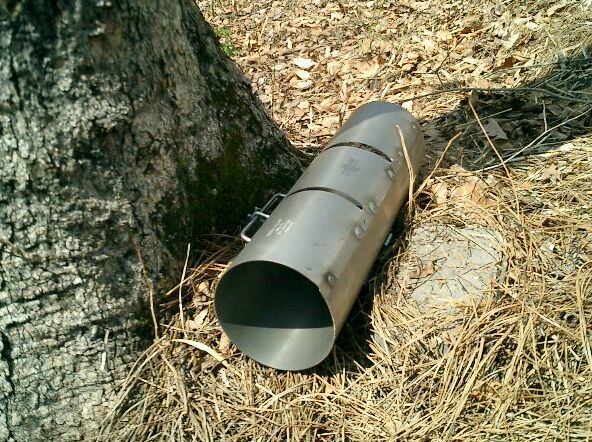 If you have observed the targeted animal using a rain down spout to climb up and onto a roof top, simply place the trap in front of the downspout for a quick kill. RATE OF APPLICATION: Use one trap for every 1-10 animals you think you need to catch. Also, use one teaspoon of bait per set to help get the targeted animal inside the trap faster. 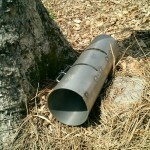 Comments on PIPE TRAP 15" X 4"
Hello, I would like to purchase 3 traps from you. However, my sole purpose to to kill Brown tree snakes in Guam. Do you think these traps will be effective for the snakes? We've had people use them for snakes effectively for large snakes with no modifications needed. Now since I don't know how big the snakes are you want to catch so I don't know if it will work "out of the box". But if you watch the video below, you'll see we use a small piece of PVC to set the trap off and this PVC is just thick enough to be "caught" so if your target snakes are in this range size wise, they should work fine. But if the snakes you want to catch are smaller, you can modify the clasping metal bars inside the trap by adding small pieces of wood or other material to effectively narrow the gap between the bars and the tube. The reason the gap is set where it is now is so when squirrels are caught, they aren't "squished" to such a point that they make a mess. But for something real skinny like a snake, making the gap smaller might be needed to insure the trap holds them in place. The second thing you may want to do is lighten the trigger setting. This can be done by lubricating it and "rounding" the catch edge with a file so it will take less movement over the internal trigger to release the latch. In summary, if the snakes you are targeting are wider than the PVC pipe used to set off the trap in the video below, the trap will most likely work as is without modifications. But if you need to have it work on smaller sized snakes, narrowing the gap between the jaws and the tube will help as will subtle trigger latch adjustments to lighten the amount of weight or motion needed to release the trigger. Will this catch rabbits ?? How to bait for rabbits ? It will work for rabbits. Not all species but common cottontails typically won't grow too big to enter so it will work for most any cottontail. Especially since they like entering tight spaces like what this trap presents. Get some of the rabbit lure (link is above) to help get them to enter. Works Great! This is my second trap, the first one worked very well for years. Great for controlling those terrible squirrels. Works Well! Received the trap and caught two squirrels the same day. Sunflower seeds seems to work well as bait. The tube is very sturdy and the spring mechanism is very strong. Being made of steel, it rusts very easily and you need to coat it with something (camo paint works well). It would have been nice to have a simple instruction book/page. Couldn't figure out what the extra "hook" was for next to the trigger because it was bent backwards. Came to realize it was a safety catch for the spring – which is very useful.